WED: VOTE NO ON CHARTER CO-LOCATIONS! The School Renewal Program rolled out last November was designed to support “low performing” schools. Since then, a disproportionate number have been the targets of charter co-location proposals. While some have already been approved, more are on the way. This Wednesday three charter school co-location proposals targeting Renewal Schools will be put to a vote by the Panel for Educational Policy. This opportunism on behalf of charter operators is not only shameful but it defeats the promise of The School Renewal Program. Show your support for public schools and demand the PEP vote NO on all charter co-location proposals! CALL 311 TODAY to Fight a Success Academy Co-Location! 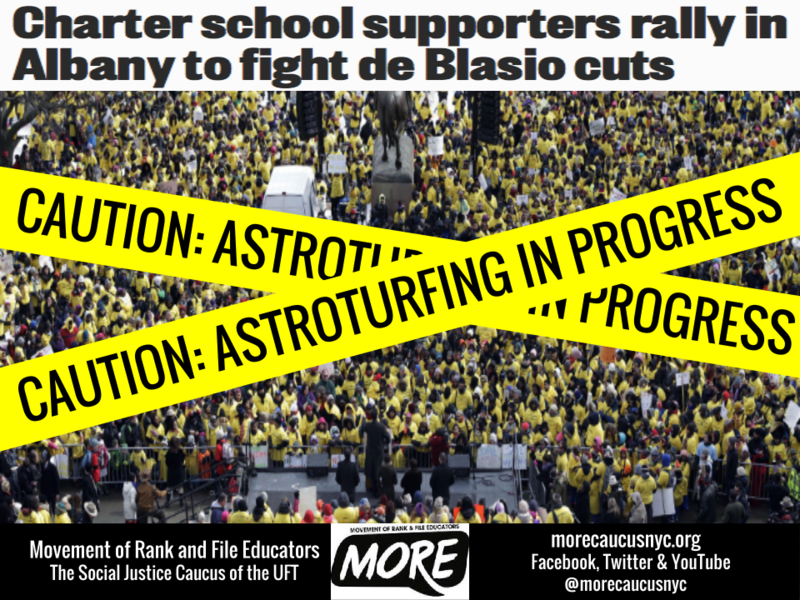 CALL 311 TODAY to demand a change of location for the co-location vote regarding the Bronx schools at 1000 Teller Ave.
It’s no secret that embattled Success Academy charter schools CEO Eva Moskowitz loves standardized testing. In a recent op-ed she wrote, “Tests aren’t perfect but something’s rotten in Denmark (or the Bronx) when a school has a 90 percent failure rate. Not having this data is as foolish as not installing a smoke detector.” One would hope Eva isn’t referring to the English Language Learners (ELL), Special Education students and Students with Interrupted Formal Education (SIFE) who predictably score lower on standardized tests (and just so happen to be routinely barred from attending her Success Academies) as “rotten.” Regardless, she considers them displaceable. A proposal to co-locate grades 3 through 5 of her Success Academy Bronx 3 charter school on the site of three district middle schools at 1000 Teller Ave. is pending approval and the community is mobilizing to prevent it. Moskowitz wants to move into the building because it is considered “under-enrolled.” That’s for two reasons: 1) the school included a fifth grade class up until two years ago when the district suddenly eliminated it; and 2) the formula that determines a building’s capacity does not take into account the lower capacity of special education classrooms protected by law to contain no more than 12 students at a time whereas general education classrooms are allowed up to 30. According to Jim Donohue, an 8th grade English teacher at Arturo Toscanini (MS145), there are no unused classrooms in the entire school. Should the proposal go through, 17 classrooms would be lost and their occupants displaced. Sadly, the comment of a retired employee whose wife attended the school rings true: “This community has never gotten any respect.” Subsequent to losing a chunk of it’s student body, 1000 Teller Ave. was designated a Renewal School on account of low standardized test scores and lack of adequate operating funds. Twenty-six percent of the student body are ELLs, ten percent are in Special Education and 40 students receive SIFE programming. These populations typically do not fare well on biased standardized tests. According to the NYC DOE website, Renewal Schools are supposed to be “accountable” for improving test scores or they will face “consequences.” It seems like engaging an entire school community in a Hunger Games-like fight for space during the weeks of high stakes testing and potentially forcing them to reorganize and re-establish their school community next school year is being set up to fail. Ostensibly, Renewal School status entitles struggling schools to needed supports. Taking away space, a resource closely linked to academic outcomes, is working at cross purposes. If 1000 Teller Ave. can’t raise test scores under these circumstances they could face being closed and replaced. Ms. Moskowitz’s bold plans are indeed upsetting the challenging Renewal School process while positioning her to benefit from the fallout. Her actions give lie to the claim that she is driven by the interests of students, especially this city’s most disadvantaged. Monday evening, while Ms. Moskowitz entertained guests at a Spring benefit that earned her 9.3 million dollars, a collection of public officials and NYC DOE administrators were seen touring 1000 Teller Ave. A vote on the proposed co-location is scheduled for April 29th but to Jim Donohue, it feels as though the deal is done. I’ve been here for 16 years, and they will have to drag me out of here to get me to leave, because I love my job. I love my co-workers, I love my principal, I love my assistant principal….but most of all, I love my students. They would tell you what I just said was “mad corny” but it’s true. I know that you folks from the Success Academy love your jobs, and your co-workers and your students, and I’m not here to attack you, or your school, or Ms. Moskowitz. I admire your passion, and you’ve brought a lot of adorable kids here tonight. But I’d like you to imagine something. Imagine a warm April evening like this one 5 years from now. Imagine 8 busloads of people wearing GREEN shirts pull up in front of the SUCCESS ACADEMY COMPLEX, former home of public school MS 145. (we’ll be out of your hair by then). What do these green-shirted people want? They want 15 of your classrooms. Maybe, like I did tonight, you overhear one of the green-shirted folks say to a child “These Success Academy people want to deny you an education!” What are you going to do? Will you agree with them? Success Academy teachers- will you quietly pack up your classrooms and move, as (incredibly) I’m expected to do? I have been a teacher for almost 18 years and the last 8 ½ with the DOE. I am now a newly delegate, however, I do feel it is important to share my story with you all to show you that you don’t need to have an official position to help organize your school. You can make a difference in any capacity. You need to educate yourself on this road of activism and justice. The truth is very ugly out there and we need to make an impact. We need to be fierce and unrelenting. We all have a voice and we need to use it loud and clear. Today we are fighting for our schools, our kids, and our livelihoods and I will be damned to let anyone take that away from us! For way too long I was a complacent special ed teacher in Harlem who did what everyone else did. I complained with co-workers which really got nothing done other than cause more complaining. My little District 75 school has been co-located with Success Academy for years. In fact, they began in my building. Over the years we have lost so much space to them, and what we gave up was never enough. In Oct 2013, Moskowitz came up with a plan that got pushed through via Bloomberg and his cronies that would have essentially kicked out my school. Enough was enough! During this time, I met Community Education Council 3’s VP Noah Gotbaum, Sen. Perkins, and a few others who spoke up for my school and something began stirring inside of me. Mayor de Blasio came into office and overturned that decision and saved my school. Of course Moskowitz got upset. In late November, I met Maria B. from the Alliance for Quality Education (AQE) and she basically gave me a crash course in organizing. She saw something in me that I didn’t even think was possible. I was very quiet, and mostly kept to myself, but I was very angry and she tapped into that. A press conference was planned on the corner of my school. She told me who I needed to call including community leaders, elected officials, and parents. I contacted the media and I discovered how useful Twitter can be for getting the word out. Our press conference was amazing. Many great people showed up to speak and even though I did not know of MORE at the time, I found out later that some of them was there as well. I will never forget how Noah Gotbaum said to me that day, “you need to speak up.” I have never shut up after that. ( Here is the link to the complete story I wrote for Crooks and Liars about what happened to my school and our battle with Eva Moskowitz.) At the end of March, Maria organized another press conference but this time on the steps of Tweed. So once again, I helped contact community leaders, elected officials, parents, my fellow educators, and the media. New York Communities for a Change was involved in the planning of this too. Maria encouraged me to speak at this press conference from a teacher’s perspective. This was on school day morning and I got permission to take a personal day for this. As nervous as I was, I gave my speech. Noah felt my schools’ story was very important and wanted me to share it again at the Save Our Schools Rally a couple of days later.. After several elected officials, I gave my speech to hundreds of people at the NY Public Library and proudly marched to Governor Cuomo’s office. By this time, I had grown more confident. I took to social media with no abandon and I met MORE. In the following months, I helped fellow MOREista Patrick, who is in the gen ed school in my building, write up a proposal for our two schools by providing him all the information needed for my school so that we could become a combined Community Learning School. We got accepted!! My admins have been very hands off on this new adventure and they just recently said that they are trusting me with this and are basically giving me free reign. Also throughout this time, Fran S from UFT was also a driving force to help our school and would advise me when I needed to write something up and who to contact. Over the summer, I was out of commision because of ankle surgery, however, I was still strong on social media. I still read, still got angry, and I did my own kind of protesting from my comfy chair. Once I was able to walk again, I did not stop and I have had my hands in many things. With the knowledge of how to organize people and how to make social media very useful, I never stopped. I created a daily online paper that collected top public education and political stories. I wrote some blogs. I wanted everyone to wake up and know what it is going on.There are too many complacent people out there, too many people not know what’s going on or simply not caring. It has become my mission to educate others, to mobilize, to organize and of course agitate. I am not above hijacking a hashtag to get the truth out there. I did so with #DontStealPossible when that came out and I have no problem sending out hundreds of tweets out daily. It is truly important to have conversations with everybody in your school and in your community. This past year, I have come alive. Not only have I completely changed as a person, but all of this activism has revitalized me as a teacher. I have always loved being a teacher but knowing that I am also fighting for my students has given me the energy, the excitement, and desire to do more. My voice does matter and I encourage all of you to think about this and be loud and proud. I will conclude with this. My journey over the past year will be one I will never forget. I have made many friends in several organizations including AQE, and as a “thank you” for all of the work they have done for me and my school, I pay it forward and assist them on issues that they are involved in that I too believe in. I have and will continue to march, rally, and protest. I will continue to use social media to the best of my abilities and I will continue to be at events with elected officials and get the truth out there. I will work hard to make my school an amazing Community Learning School, I will continue to be there for my school staff in any way I can be and I will keep fighting for my kids. I am a very passionate person when I believe in something and I believe it shows. I will never forget what Maria from AQE, Noah Gotbaum, and Fran S., did for me in helping to create the activist I am today. I will continue to speak up and speak out. I will also forever be grateful to MORE for allowing me to grow with them and to fight alongside of them. We have lots of work to do and I am not going anywhere! I am far from being done yet and our battles are many. Now, I know I have touched many nerves over my journey such as those in Success Academy, Families For Excellent Schools, and moaning Mona Davids and her puppet Sam, and that makes me VERY happy. To me that means I am doing something right. Everyone reading this little blog piece is powerful. Tap into that power, and give ‘em hell!!! What is your #WhyImTeacherActivist story? And what would the response be if teachers shut down the public schools for a day to bus students to a political rally?